…EVENTS, and links that will inspire, bring more positive flow and awareness, give you tools to find balance, joy and greater abundance in all you do. Offerings include Animal Communication, Feng Shui, Art and Personal Energetic Discovery, along with Huna workshops and talks! Check out “what’s coming up” in the below events and links. Connect up, sign up, get involved, and explore your heart’s “talk”! April 15th, Tuesday 2008 -My book “FUR SHUI®” is released!!!! Go to my website: www.furshui.com and order! February, 2013, “FUR SHUI®” sells out and is now in 2nd release, bigger, better! December 1, 2009 – January 1, 2010 and beyond! CONGRATULATIONS TO “FUR SHUI”!!! Now “Fur Shui” is on the shelves in Italian. Bella for the book! Anyone who is interested in the Italian version, the book title in Italy is: “IL TAO DEI BATTI E DEGLI ALTRI AMICI DELL’UOMO. Guida al Feng Shui per gli animali domestici, Published by AVALLARDI. It is fun to see cats purr as “Rron, Roron”! 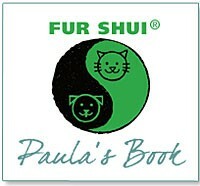 Now “Fur Shui” is in the UK, Italy and the US and Canada! Ciao!!! Learn how to empower yourself and your world with energetic principles from Black Hat Feng Shui, Purpose heart communications and “hunting”, and Huna applications all meant to connect you up with your heart journey and the heart of nature! 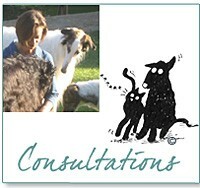 Contact me at: paula@animalhearttalk.com for further details and schedule! How to unleash your prosperity in the year of the dog! It’s the Lunar Chinese New Year of the Earth Dog. Discover some Feng Shui tips to help you shift from last year’s “fire” energy, to this year’s “earth” energy. put ease and prosperity in all aspects of your life. Find out “who” and “what” is guiding you on your purpose path from the animal spirit kingdom. We all have guides in this world as well in the world of Totem animals and nature spirits. Come dive into your quest to find your own unique guidance system connections you have with nature! 2 hour guided meditation class…and you need not have any meditation experience to participate. Bring: a journal and a pen…possibly a sketch book if you wish to draw! Any “sitting” cushions, chairs provided…and bring your own dry snacks and drinks. An open heart and a desire to do some purpose connections to nature “questing”! A costume pawty for your fur folks / dogs! I will be doing a “one question” animal communications for this event. Bring a color photo of your fur folk or in person fur folk. Sessions are 15 minutes, fee is $40. Fee goes to providing early breast cancer screenings to medically underserved women in Orange County. February 13, 2016: The Chinese New Year of the Red Monkey Talk! What is the personality and traditions of this new year of the monkey? What are some things you can do now to continue your prosperity and abundance? Join in and gain a few auspicious New Year tips, and open up to the flow of fresh new energy coming to us all this year! Bring “9” dollar bills (you will not be buying anything) and note paper and pen or pencil. Registration for this event required. To register, please call Restful Steep at (310) 891-6985 or purchase tickets online. February 14, 2015 Valentines Day! Love is in the air in February, and it is being expressed at a special event down in Del Mar, CA at Dexter’s Deli. I will be a guest panelist and communicator at the 3rd Dexter’s Deli “Talk to the Animals III”. This event benefits two animal causes: “Freedom Dogs” and “Wounded Warriors Service Dogs”. Come on down and have a lovely Valentines Day! Find your flow with Feng Shui! This two hour class will introduce you to all the magical energies already living in your home, office or space! During this two hour class you will be introduced to the basics of black hat feng shui by learning about the energy “treasure chest”; the bagua. their “colors”, numbers, elements, roles. area and “amp” the chi up! • How your “intention” makes or breaks what you do with feng shui. • How your pets use this flow of free energy inside your and their environment! This two hour class will introduce you to all the magical energies already living in your home, office or space! Want more abundance, harmony, clairity…come on down to the Mystic Journey bookstore and treat yourself to come positive chi flow! Practice the Attitude of Gratitude! Come to the Gratitude Circle; enrich your life, increase you joy, NOW. Learn how to empower yourself and your world with the basic principles of Hawaiian Huna! In this 2 evening talk event you will be introduced to the basic assumptions and principles of Hawaiian Huna. Come and find out how you can harmonize relationships using these principles and living these assumptions. First night: Introduction to to “Whats” of Huna and its basic principles, primary assumptions…first 3 principles explored along with calming breath instruction. Second night: Final 4 Huna principles introduced along with “Aloha” meditation and other peace generating tips! How to get out of your head and into your heart Workshop. Two days of energetic exploration and learning! Day one: Explore the basics of Black Hat Feng Shui. You will find out about your environment’s “chi” by learning all about the energy road map called the Bagua. Discovery (with the help of my book “Fur Shui”) and meaning of all it’s life spaces or guas and apply your new knowledge to your living spaces. Day two: Introduce yourself to the wonderful world of communicating with animals. Find out how to relax your mind and start listening with your heart to begin heart to heart talk with pets and nature. You will find out the basics of what you need to do to talk with the animals! 2007-2017 All rights reserved Paula Brown Heart of Conversation Paula Brown. 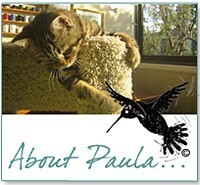 All content is copyright of Paula Brown. Stiff penalties for any use or copy under the US Copyright Laws without prior consent of Paula Brown.